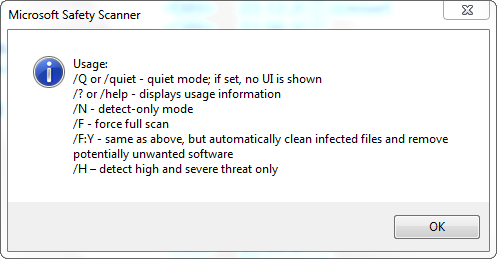 If you’re looking for a FREE Virus and Malware scanning tool that does not require installation, have a look at the Microsoft Safety Scanner tool. The software runs on Windows 7, Windows Server 2003, Windows Vista and Windows XP. I wonder why Server 2008 and 2008-R2 are not listed, but the fact that it does support Server 2003 makes it a perfect utility for my Windows Home Server. 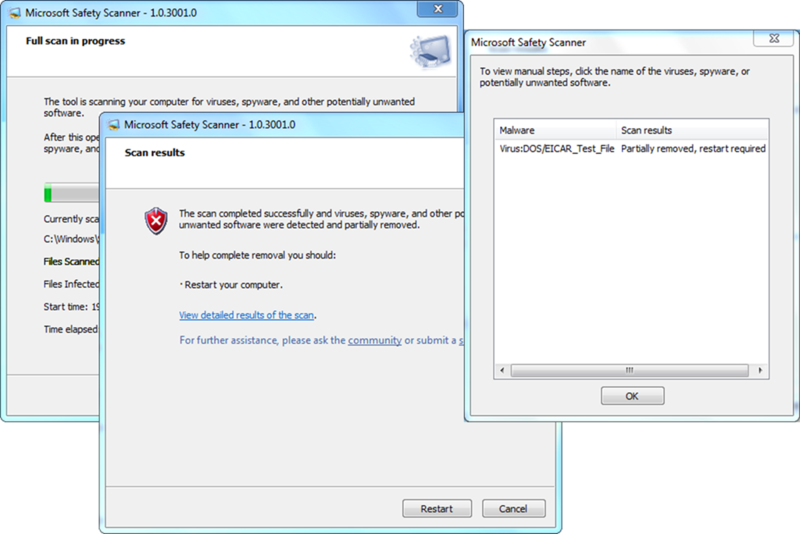 Note that the Microsoft Safety Scanner does not provide Real Time protection, so consider this tool for scan and remove purposes when other software fails to remove a threat. Also note that the executable is about 70 MB and is only valid for 10 days, after that you must download the software again, witch contains the latest signature files. Been using – MSERT – for some time (years) now – but I’m curious about its functionality. When choosing the TYPE of scan – CUSTOM …. is there a way to avoid the ‘Quick Scan’ when I choose to scan a drive or folder of my choice? Problem is the Custom scan which includes a ‘C’ drive quick scan is actually a FULL ‘C’ drive scan! I’m in tune with the time a ‘Quick Scan’ takes – one minute 47 seconds. It seems the Custom scan which, it states, includes ‘Quick Scan’ – IS scanning the entire ‘C’ drive. I say this because 22 minutes into a CUSTOM scan – it started with the ‘C’ drive and is still scanning the ‘C’ drive when I canceled it at 22 minutes into the scan. Ever notice your CPU temperature during an full ‘C’ drive scan? Previously I have allowed it to perform a custom scan until it is finished – it takes quite a long time. The point is – it eventually scans the drive or folder I custom selected. Will not go into the detail of the efforts I go through to protect my computer – but – if I feel I want to check a folder I programmed to store items of interest more frequently – without an scan of the entire ‘C’ drive I will not be putting my computer through an heat stress so often. A Quick scan should not be assigned by DEFAULT. Heat shortens the life of a computer. I may sound harsh BUT – I do not believe Microsoft cares if your system fails because of heat issues – after all new equipment makes money for them and others. AND – those people under MS employ are provided the fastest and newest systems to perform their work so they design Software/Programs for THEIR computer equipment environment without a caring thought about anyone else! You will – as always happens through the years – [when you notice your system seems to perform slowly] – be told that you may have an Virus; Malware or you installed something or you did something that ’caused’ the issue. Sending you on an unnecessary wild goose chase! My CPU temp is invariably 98 degrees – 102/08 degrees if I have on a video. During MSERT full ‘C’ drive scans it goes to 150 plus degrees. If your opinion that 150 degrees is not a concern – I respectively disagree. So – is there a way to tell MSERT, Microsoft Safety Scanner to only scan what is selected in CUSTOM type scan without a Quick scan? Or – have it fixed to DO a ‘C’ drive quick scan along with whatever I choose to scan?